The committee is proposing a general meeting in the very near future and all members will be invited to attend. Watch your emails for details soon. We are planning a Field Day later in 2014, check back for details later. We have members attending the above shows. Please come along and see us, our animals always love visitors. Have a chat and learn more about our wonderful breed. 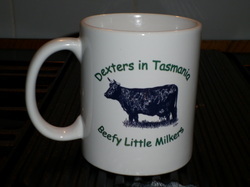 We have some lovely mugs for sale at the moment, they are white mugs with our Dexters in Tasmania Logo and green writing.